A 5-minute walk from Nam Song River, Diamond Villa offers air-conditioned villas with a terrace in a quiet location. The property is equipped with free WiFi in rooms and public areas. Other services include tour desk, luggage storage and restaurant. 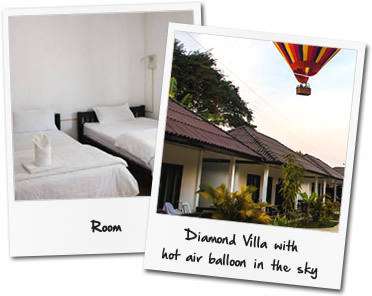 Diamond Villa is a 10-minute walk from Tham Jung cave. It is a 10-minute drive to Vang Vieng Bus Station and a 20-minute drive to Tham Phu Kham Cave and Blue Lagoon. Airport Wat Tai is 150 km away. Fitted with tiled flooring, each villa is furnished with simple décor. Each unit comes with a flat-screen satellite TV and an en suite bathroom with shower facilities and free toiletries.